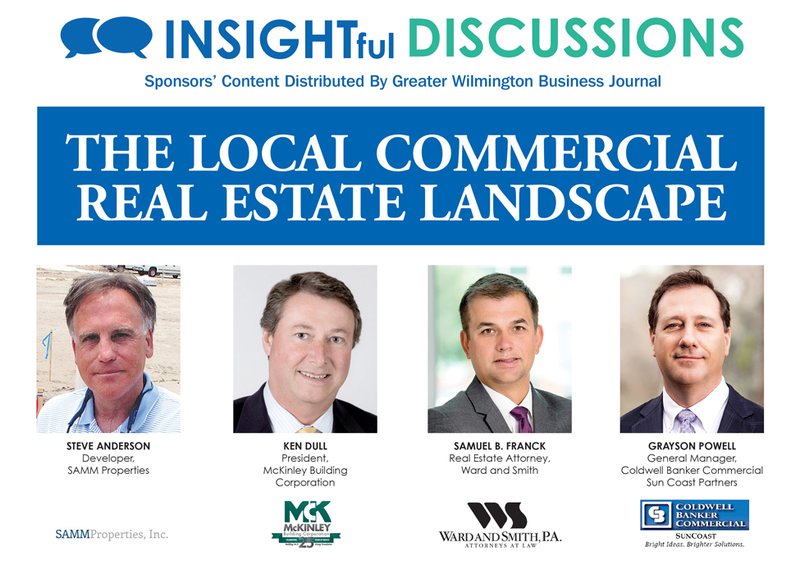 From construction on a mixed-use development - anchored by a movie theater - in midtown Wilmington and expansion at Mayfaire Town Center to a surge in apartment complexes and the arrival of new grocery store chains across the area, the Port City has certainly seen its share of commercial activity in recent years. With growth comes new opportunities for our area, as well as challenges. In the following pages, five experts in the field share their input on current market trends, traffic woes, the potential impact of proposed changes to the county’s permitting process and future outlooks, among other topics. GRAYSON POWELL: It’s strong, stronger than it was in the peak in 2007. The market is strong in several areas: the quality of the tenants; the quality of the loans; and in buyers’ financial strength. These factors combined have created a strong market in which commercial real estate is a much more stable, long-term investment than it was before the economic downturn. One possible exception is the multifamily market, which is quickly reaching its peak. At some point, multifamily will correct itself. The flow of bank funding has slowed significantly in the last couple of months. Right now, there is still a lot of money out there chasing quality properties, but our inventory for commercial income properties is low. This demand is driving the prices up and the cap-rates down. I think the market will continue to be strong over the next year or so, but it’s difficult to predict beyond this point. STEVE ANDERSON: I think this is a very active market, from all the offices to mixed-use communities and small commercial centers coming online. Throughout the three-county area, it’s very sound. It’s the most active I have seen it since 2006, and it’s a healthy busy. In 2006, it was an unhealthy busy. It was a free-for-all. People were paying over listing price daily. This is a lasting growth we’re seeing now. KEN DULL: I think the commercial real estate market is in full swing and it really just got there in about the last six months. Commercial real estate always lags behind a surge in residential. Residential folks were really busy three years ago and we weren’t. But what people like to call the “Trump bump” has instilled some confidence in small business, and small business may be feeling like it’s time to grow. The true sign a commercial market is coming back is when those making it happen are the business owners who see it’s time to move forward. What is the most interesting trend you are seeing locally? ANDERSON: Over just the last three to four weeks, we have seen an explosion in the number of calls about office space, and they have been sizeable – 5,000 to 50,000 square-foot users. We’ve had several within that size range. Commercial real estate follows employment numbers, so as employment goes up, so does the demand for commercial real estate. And new residential real estate development calls for specific services, like satellite offices for healthcare providers. We’re kind of on the back end of the parade; residential real estate drives what we do. DULL: I think one of the most interesting trends I’m involved with as a builder is the multifamily aspect. We just finished Sawmill Point Apartments. It’s open now and leasing is going really well. There doesn’t seem to be any end in sight with multifamily. There is still room for more absorption. There are still lots of folks planning more multifamily projects, and I believe they know what they’re doing. POWELL: Storage units! They are going up everywhere, and they are getting bigger and offering more services. Everyone says retail is dying, but at the same time we seem to acquire so much stuff, we need to rent storage units to contain it all. Many of the aging baby-boomers are downsizing and renting storage units to store their possessions to hand down to their children one day. Based on what I see, the Millenials may not even want our stuff. Another interesting trend is leasebacks, in which a company sells its real estate to an entity that then leases it back to the company. In this way, companies are refocusing their capital away from real estate and back into their business. More businesses are turning their property over to companies that do real estate for a living so they can focus on their own business. DULL: I spent six years on the county planning board. I spent six years on the city planning board. And now I am chairman of the Wrightsville Beach Planning Board. I think you either have to decide to be part of the process or you just have to watch it happen. Either get involved or don’t complain. I am obviously pro-business and pro-growth, but I’ve been here in Wilmington for 30 years and I believe this town has moved in a net-positive direction. And if there is anybody who cares, it’s the people who are doing the work, because we don’t want to kill the goose that lays the golden egg. POWELL: You protect the areas that are icons of your community, such as the beaches and downtown Wilmington. To control what happens in these areas, we need to free up other areas for growth, because growth is inevitable if our community is to continue to thrive. The biggest impediment to smart growth right now is restrictive building heights. Historically, we have kept building heights low to keep that “small-scale” character in our community. But as a result, we’re producing sprawl. If you can’t grow up, you grow out. We need to allow buildings to be taller so we can achieve greater density, prevent sprawl and create more green space. ANDERSON: You do that through smart planning, smart zoning, smart designs, smart landscaping, smart refill and rebuilding. As a Wilmington native, it’s great to see the growth but saving green space is very important, as is ease of access and superseding what the code requirements are. When we have a project, we take the city’s minimum code requirements and say, “We’re going to exceed that.” I get a team together and say, “Where is it smart to add to the city’s minimum requirements?” That makes sense not only from an aesthetic point of view but with maintenance, too, and to preserve that coastal look we all love. DULL: I think the apartments - and more so the lifestyle apartment complexes and places like Brunswick Forest and Compass Pointe - are going to be big drivers moving forward. They were before the downturn, and I think that’s going to be what pushes the needle forward in southeastern North Carolina more than anything. We’re halfway between New York and Miami, and people have decided that’s better than being in New York or Miami. Now it’s not, “I’m moving to Miami;” it’s “I’m moving to Wilmington or Charleston or Savannah,” or somewhere like that. POWELL: I think we will see some existing retail facilities, like retail malls, follow this trend and convert to a lifestyle community that combines office, retail and residential in one area. Millennials are much more interested in this lifestyle than the baby boomers and they are certainly having an impact on this trend. These lifestyle centers will likely go through significant change at some point, because retail is going through a sea of changes right now. The way we shop will change, but it is hard for me to believe we are all going to hide in our houses with our iPads and wait for the doorbell to ring. We will continue to seek out each other and experience the fun of shopping for stuff to put in our storage units. ANDERSON: I am going to continue to talk about what works, and the proven product for multi-use development is Mayfaire. There really is a mix of ages in Mayfaire – retirees love it, millennials love it, people 55 and over at Cambridge Village [retirement community] love it. I really think now it has come full circle at Mayfaire; we have all ages here and I think it shows that lifestyle communities bridge that generational gap. DULL: Sawmill Point’s target demographic is new retirees and Millennial professionals, so that project is a perfect example of something that is driven by exactly this issue. That’s why that project is there. It’s not workforce housing; it’s people who have decided, as older folks, that they don’t want to own real estate anymore and then Millennials who don’t want to own real estate right now. What current transportation issues do you think need to be addressed, and what do you think will need to be addressed moving forward? POWELL: The two most important transportation issues that need to be addressed are public transportation and another bridge across the Cape Fear River. According to New Hanover County, our population is projected to increase to 300,000 by 2040. That equates to a lot of cars. Our public transportation system is underutilized, and we need to continue to make improvements to make it more efficient and user-friendly. Ultimately, we need to prioritize our needs and wants. If we want more green space and less traffic, we’re going to have to live with taller buildings and use public transportation to get to them. The growth in our area is not going to be just in New Hanover County either. Brunswick County is going to grow, as well. The citizens of Brunswick County are going to want to come to Wilmington and the citizens of New Hanover County are going to want to go to Brunswick County. I live in Wilmington and love to go down to Southport and Bald Head and over to Leland. I drive down to my hometown of Whiteville often. It’s better now that the causeway has been widened, but another 90,000 people over here and even more in Brunswick are going to put a strain on the three crossings we have. The life of the Cape Fear Memorial Bridge is pretty short. We need to work through this before it’s too late. DULL: I always like to tell folks, “If you think it’s bad at the corner of College and Oleander, go to Research Triangle Park at 5 o’clock.” And to folks there who think it’s bad, I’d say, “Go to D.C.” It’s all relative. Nobody wants to drive through rush-hour traffic but personally, I don’t think we have a traffic problem. I just think we’ve got to stay ahead of it. I’ve spent 15 of my 30 years here working on planning conditions. I think it is my duty to use my knowledge for self-serving reasons, and I mean self-serving in the sense that I want to make sure the traffic doesn’t get bad and the water stays clean. Where do you see opportunities for new construction? ANDERSON: Last year, I said to pay attention to the area from the Offices of Airlie up to Hugh MacRae Park, and now look what’s going on there. Wrightsville Beach Brewery opened up. Wells Insurance has an office. Scuba Now is in the old Bert’s Surf Shop. There is a lot of activity going on along Oleander Drive, and soon to come is Bradley Creek Station, a 5.8-acre site with over 70,000 square feet of office and retail space. There is a lot of new construction but we’re also seeing a lot of residences now being turned into retail spaces. I think that area will, over the next little bit, continue to grow. And the good news is, it’s all either new construction or they’re having to bring properties back up to code. where a lot of the next growth will be. POWELL: The corridor of Carolina Beach Road from Monkey Junction to Snow’s Cut at Carolina Beach has many opportunities, as does US-421 and Castle Hayne. Compass Pointe in Brunswick County is another growing area. With the completion of I-140, Windsor Park, Compass Pointe and the surrounding area will become a major center for development over the next several years. Pender County has a great deal of available land but the current zoning structure needs to lend itself to easier use - and water and sewer systems need to be built in many areas - for Pender County to benefit from the coming growth. There will continue to be infill and reuse projects throughout New Hanover County, such as Mark Maynard’s redevelopment of the former Nesbitt Courts public housing complex into South Front Apartments. What a change that area is experiencing. You’ll see other developers and investors look for opportunities to take advantage of that synergy. And to me, midtown is Market at Covil Avenue all the way down to The Pointe. That is a continuous commercial node and there is a lot of opportunity there for redevelopment. POWELL: There is a great opportunity for redevelopment at Carolina Beach Road from Third Street to Shipyard Boulevard. This is a very nice area close to downtown and midtown, and it has been left unattended for too long. This could be one of the areas that benefits from the South Front Apartments project. Other great opportunities exist in Castle Hayne. With its proximity to downtown and the Cape Fear River, there are many assets waiting to be redeveloped. The success of the River Bluffs neighborhood and other new home communities will start to generate some new commercial development. Anywhere you’re developing new residential properties, the commercial properties and services will soon follow. ANDERSON: Again, I think Oleander Drive is a jewel. It’s a road everybody knows and uses. It connects the river to the sea. And it’s been here longer than I have. How would the Unified Development Ordinance (UDO), if approved by New Hanover County officials, streamline the permitting and building processes? FRANCK: Development is a fundamental private-public venture. Well-designed development regulation should be consistent, transparent and enabling to encourage private land owners and other stakeholders to contribute to our community through development. In addition to the direct impact on existing stakeholders in the community, effective and enabling public guidance on development is an important factor to major companies that consider relocation to Wilmington. Therefore, a carefully considered development ordinance that values productive development over maintenance of the status quo is a significant economic development tool for our region. A Unified Development Ordinance could help make our land regulation scheme more transparent and more effective. POWELL: As the county goes through the UDO process, I would like to see the permitting and building processes be more clearly defined. Commercial developers should not have to question whether a project will fit into a specific area; the UDO should clearly define specific uses as much as possible so that everyone involved in a project can go to the table and understand what is permissible. What we cannot have is an approach that allows everyone in the community to look at a prospective project and decide whether it is something they want in our community. That is not a plan; that is a recipe for disaster. Let the community come together at the beginning of the process, define what we want through the UDO, then allow the development to work within that requirement. Everything will go smoother. DULL: The jury is still out on that. It’s hard to stay. The process has been more favorable recently for residential but we don’t yet know for commercial. It could make it better; it could make it worse. The county piece has been good but we need outside agencies – as in the CFPUA and NCDOT – to be more user-friendly. The county has been extremely accommodating in trying to make it better for us but until they get outside agencies to coordinate with them more completely, we won’t see much change. We need comprehensive coordination. Will the popularity of e-commerce change the way the commercial real estate industry thinks about retail centers? DULL: I do think that e-commerce is changing the way we’re thinking about retail centers. I think it’s going to slow down big-box development over time. I still think there are certain things people like to go touch and feel before they buy. I think Amazon will replace a lot of retailers but I think people still want to actually go to a store for certain things - to buy food, to try on clothes and shoes and things like that. POWELL: E-commerce is certainly having an impact, but the retail industry is also suffering from a gross oversupply of square footage. According to Forbes, the United States has roughly 50 square feet of retail space per capita, while Europe has just 2.5 square feet. More than 3,000 stores nationwide have closed so far this year, and analysts predict that number could increase to 8,000 before year-end. E-commerce has changed the rules of the game, but there will always be a demand for retailers who continue to evolve to meet the demands of today’s consumer. Ross, TJ Maxx and Marshalls are hugely successful but Sears, Kmart and JCPenney are struggling because they have failed to evolve. The best locations will continue to attract the best retailers and consumers will continue to buy both online and in-store. Retailers that adeptly combine their best in-store and online experiences will continue to succeed. ANDERSON: It is already taking effect. It has definitely changed. You’re looking at seeing more of service-retail types of businesses, where people have to go in to get what they need. I think the retail the community calls for will continue to get stronger. Look at what Point of Sale has given to retailers; it has made retailers smarter and forced them to rethink everything about how they manage their business. So, I think those that are still with us will just continue to get better. But I think with new retail, especially, you’ve got to have a niche to succeed. You’ve got to figure out what you are and be the best at it.